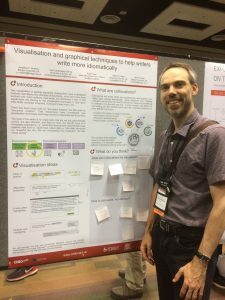 Professor Jonathan C. Roberts presented the poster: “Visualisation and graphical techniques to help writers write more idiomatically,” (Roberts, Frankenberg-Garcia, Lew, Rees, & Pereda, 2017) at the IEEE Conference on Visualization (VIS) in Pheonix Arizona. A video preview of the poster can be found here. IEEE VIS 2017 is the premier forum for advances in visual analytics, and scientific and information visualization. The event brings together top data visualization researchers and practitioners from academia, government, and industry to explore their shared interests in tools, techniques, and technology. This entry was posted in posters, presentations. Bookmark the permalink.